Open either in winter or in summer for lunch, the Petit Lay restaurant will welcome you on its large terrace or by the fire inside. 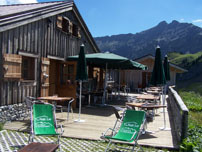 Located at 1435 meter high in the middle of the Cote 2000’s field, the restaurant and its large terrace offer you one of the nicest view on the Mont-Joly range and the Aiguilles Croches. In winter children will enjoy the pleasure of snow riding their sledge or making snowman. And in summer it will be the swing’s turn to be the attraction, well assist by the friendly Donkeys (and their babies). 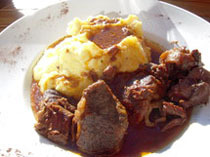 You will get a familial and traditional dishes: tartiflettes, fondue, Megève’s farcement, our meet (some of the best French races and even sometimes some of our own product), day special,… and a large selection of home made deserts. You can make it easily by car, we are left hand by the road, 6 km from downtown of Megève to the Cote 2000 (1 km before the airport). 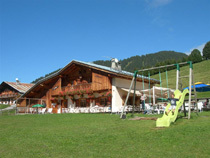 You can also reach us by bus from Megève or also by walking (we are just next to the walking slope in winter). For questions, reservations or event’s organisation you can call us : 0033 4 50 91 91 26.